Winter has arrived. Cue the griping. So to sum up: Winter is cold and gray and often slippery, snowy, wet or all of the above. One of the reasons I like to leave echinacea standing in winter are these great snow-capped seedheads. The last time I went downhill skiing was the day before I had my first knee surgery more than a couple decades ago, so I don’t have a lot of winter outdoor hobbies to look forward to. From a personal standpoint, snow is a drag. From the gardener’s standpoint it’s a blessing. And never before have I wished for more of that blessing. Like much of the country, we’re in the middle of another extreme winter. In the last week the low at our house was -17 degrees. That’s Fahrenheit. The forecast suggests it will be colder than that in the middle of this week and the long-range forecast shows little relent from extreme temperatures. 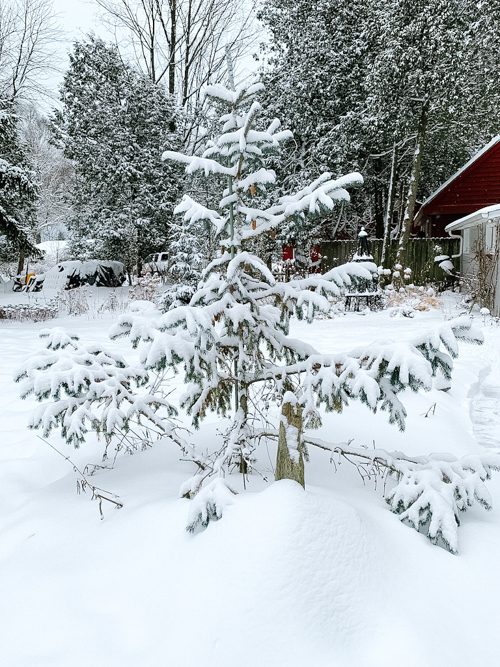 Picea engelmanii ‘Blue Magoo’ with a nice coating of snow. I live in zone 5, and technically zone 5b, which is supposed to be the warmer end of that zone 5 range. Zone 5 is temperatures down to -20. In other words, we are dipping precariously close to temperatures that are very dangerous to most of the plants of my garden. And other than just crossing my fingers, there is only one other thing that will help at this point. There is a boxwood under all that snow. I went back and lightened its load after I took this photo. That fluffy white stuff (at least I hope it’s fluffy, because the only thing that stinks more than a big snowfall is a big, wet snowfall) is the best insulator there is. 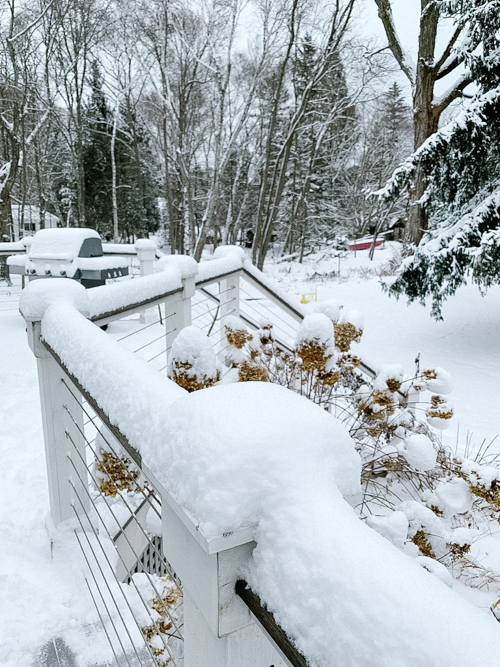 According to this site, a foot of snow provides as much insulation as a wall filled with fiberglass insulation. I have no idea how that translates to actual temperature, but I know it will help keep the roots of my plants protected, and that’s the most important bit. Last winter wreaked havoc on my garden, leading to more plant losses than I’ve ever experienced in a single year. I blame very warm temperatures in early winter followed by a cold blast for that. Had there been some snow on the ground (I don’t recall really having much until very late winter) plants would have been protected from both of those extremes. The dogs know they aren’t allowed in the garden, but I can’t really blame them when they can’t see where the grass ends and the garden begins. Prior to a large predicted snowfall we had about a foot of snow on the ground. I’m counting on it to help my plants out through extreme weather. By the time you read this post it’s likely we’ll be in the middle of a very large snowfall, possibly up to 15 inches over 12 hours or so. With the foot or so of snow we already have on the ground, the plant insulation is adding up. So even though I’m dreading the snow clearing and terrible driving conditions that will follow I say let it snow, and let it snow a lot. 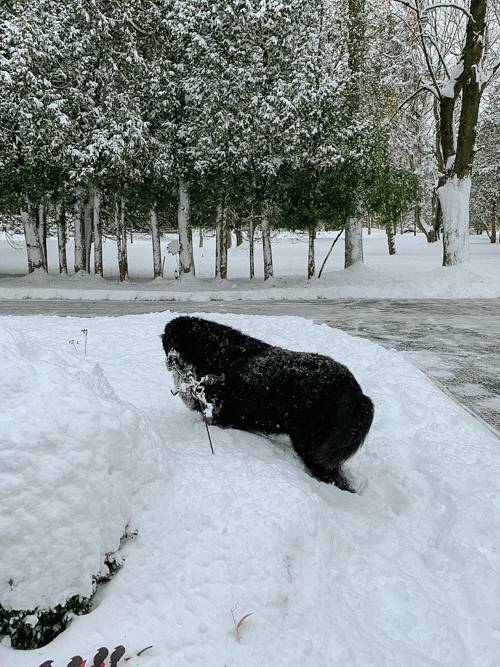 You have the perfect dogs for this snowy cold weather. Like your dogs my Annie doesn’t follow the rules in winter even though we don’t get as much snow as you do. It seems when the perennials flop and disintegrate she just goes her own way. It hasn’t hurt much over the years so I am not gonna complain about it. I will complain about this crazy weather. We are having 46F today and it is only supposed to be -3F actual temp Wednesday then by Saturday up to 50F. My poor garden doesn’t have much of a chance. It will probably be encased in ice through out not snow. WHINE… Thank you for listening I feel much better. 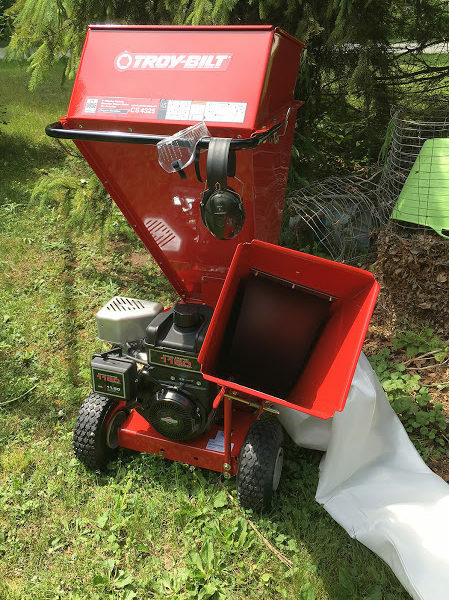 I was raised in Connecticut and we always called snow , ” poor man’s fertilizer, ” and also knew that it was a good plant protector. 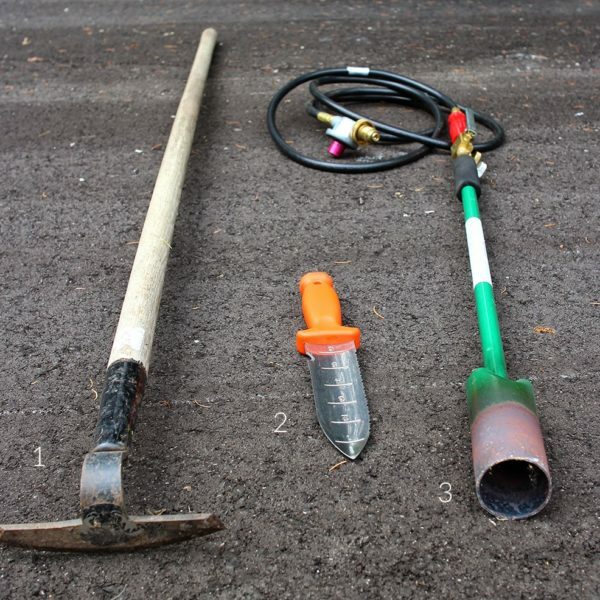 Winters here in North Carolina are certainly milder but dry ,snow free cold can be devastating to our plants and our ice storms can topple trees and demo!ish our shrubs. 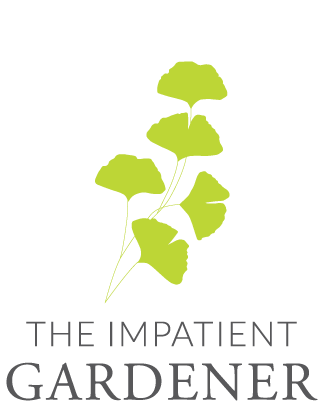 I guess we gardeners are never happy no matter where we are. Stay warm and hope for an early spring. Our central Iowa garden covered with deep smow-thank goodness!Wed.’s high is supposed to be -15,nighttime-30 below.And a wicked wind until Friday.We EARN our springs in the midwest! 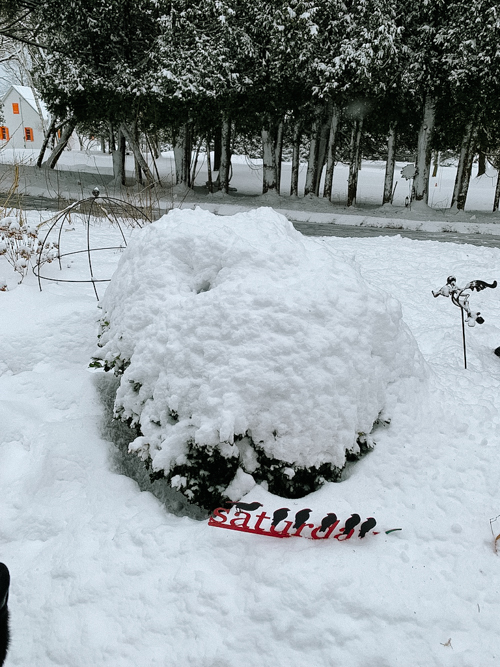 Well, we have LOTS of snow in our Quebec garden, more than usual, according to our neighbors. Hope it’s a good insulation! We’re experienced a snowy winter for the first time, as newbie winter folks, coming up to Quebec from North Carolina for 5-6 weeks this winter. It’s formidable and interesting, but as outdoor folks, we’ve embraced X-C skiing on our new hybrid ski-shoes in the nearby national park and the local greenways turned ski and snowshoe and hiking trails. As long as the power is on, and we don’t skid off the road, all is good. But we’re going back to NC before mud season, so are still cherry-picking winter. Since I pushed the zone with a couple plants last year I’ve been hoping for good snow cover. The 15 to 18 inches we have now should help when the deep freeze hits on Tuesday though I’m a little worried about the plants in the garage. There are catalogs to look through just in case a new opportunity arises. You beat me to writing this post. So many rocks, shrubs, hoops and whatnot are totally buried that it is too dangerous to try to get out and lighten the load. Thanks goodness for the snow if only it came without these temps. We have no snow in coastal Connecticut and very low temperatures coming this weekend. We are having drastic temperature swings, high 40s to near 0 within a couple of days. We had similar weather a couple of years ago and I lost a number of bushes, especially Butterfy bushes. Sad 😢 Plus as a middle school teacher, snow days rock! 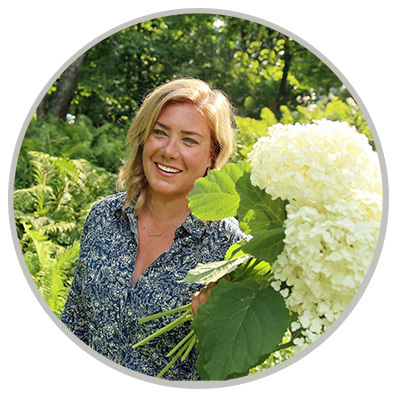 I love your blog postings and can’t wait to read more about your garden this spring. I wish that the temps in central North Carolina would provide us with a snowfall like yours. We did get some before Thanksgiving which was a huge surprise. I am looking forward to gardening and rocking on my front porch as spring approaches in a few months. 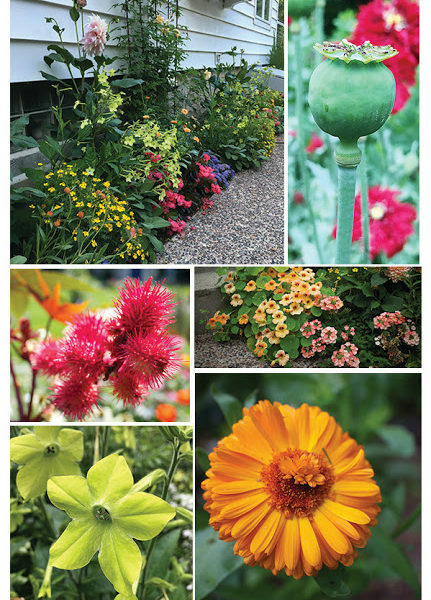 I really hope that your garden survives the heavy snowfalls this winter. 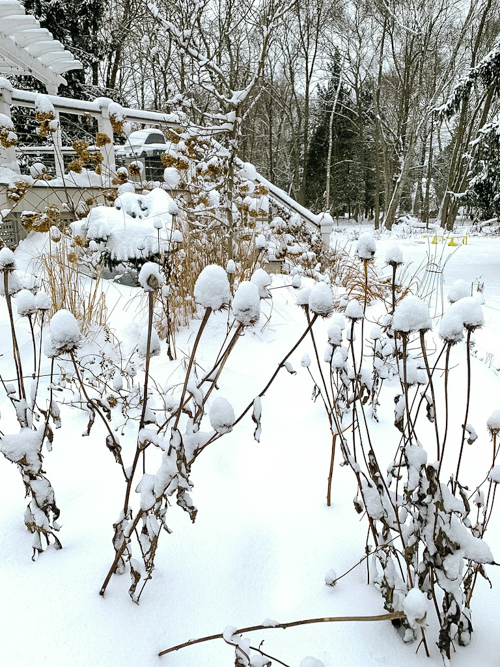 We can never be satisfied – here I sit a few days after knee surgery thinking that the bare ground combined with cold cold temperatures here in RI only mean bad news for many of my “let’s see if we can really get 6B/flirting with 7 out of it” plants. No snow for us so far this winter. In Saint Paul we had the worst case scenario last week. Only about 3″ of snow cover and 30 degrees below zero on Thursday and nearly 50 degrees Saturday. Yep…. an 80 degree swing in less than 72 hours. 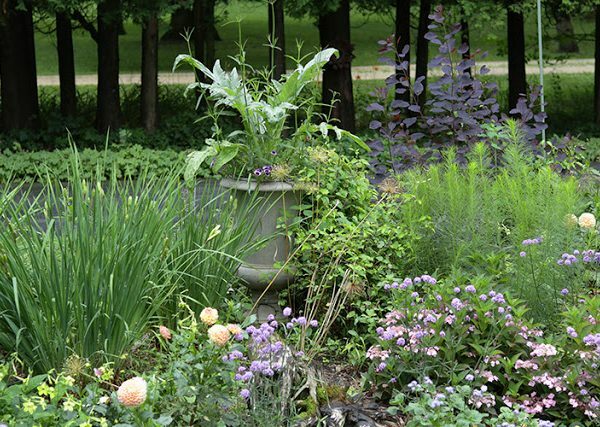 I had already started plans for a garden redesign this spring and I suppose we’ll just need to wait and see what has survived to be a part of the next iteration. 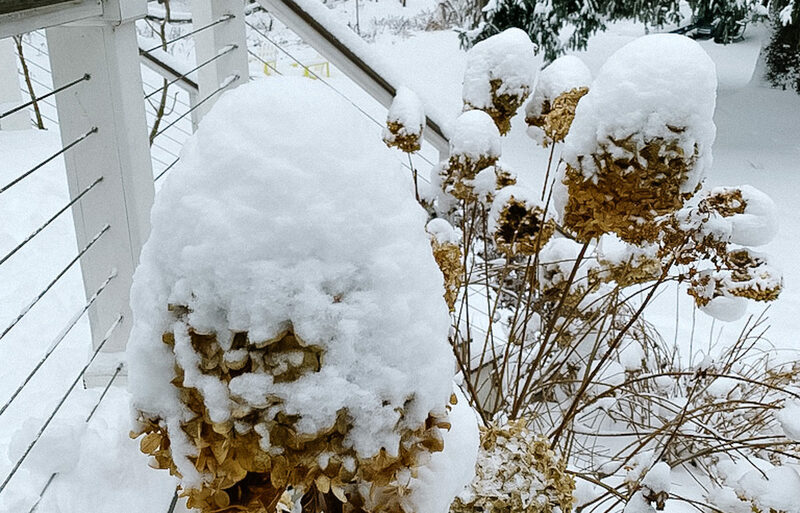 How do protect plants when snow is not a reliable part of winter insulation? I’m actually asking for advice!